The MAX965 MAX970 single/dual/quad micropower Comparators feature Rail-to-Rail inputs and outputs, and fully specified single-supply operation down to +1.6V. These devices draw less than 5A per Comparator and have open-drain outputs that CAN be pulled beyond VCC to 6V (max) above ground. In addition, their Rail-to-Rail input common-mode voltage range makes these Comparators suitable for ultra-low-voltage operation. A +1.6V to +5.5V single-supply operating voltage range makes the MAX965 family of Comparators ideal for 2-cell battery-power 739 ed applications. 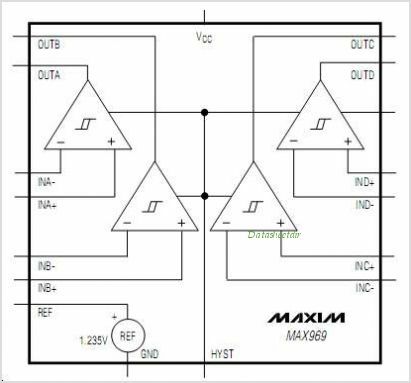 The MAX965 MAX967 MAX968 MAX969 offer programmable hysteresis and an internal 1.235V 1.5% reference. All devices are available in either space-saving 8-pin MAX or 16-pin QSOP packages. This is one package pinout of MAX969,If you need more pinouts please download MAX969's pdf datasheet. 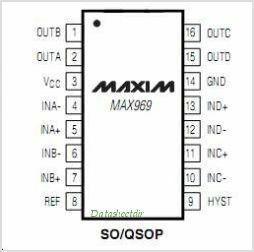 This is one application circuit of MAX969,If you need more circuits,please download MAX969's pdf datasheet.